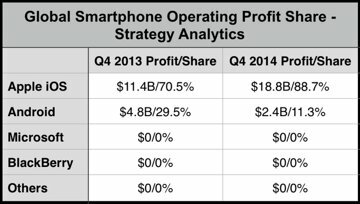 The latest breakdown of industry profits by operating system from Strategy Analytics was released on Thursday and provided to AppleInsider. Total smartphone operating profits reached $21 billion in the fourth quarter of 2014, up 31 percent year over year, thanks entirely to Apple. That growth was led by Apple and its blockbuster iPhone 6 and iPhone 6 Plus, which captured the overwhelming majority of the industry's profit. Android, meanwhile, was relegated to a record-low of 11 percent global smartphone profit share during the quarter. Apple's share of smartphone profits was also up significantly from the fourth quarter of 2013, when iOS and the iPhone represented a 71 percent share. Apple's profits grew from $11.4 billion in the holiday 2013 quarter to $18.8 billion a year later, while all devices running Android fell from $4.8 billion to $2.4 billion in the same quarters. All other competitors— Microsoft, BlackBerry, and others— did not turn a profit in either the holiday 2013 or holiday 2014 quarters. "Apple's strategy of premium products and lean logistics is proving hugely profitable," said Neil Mawston, executive director at Strategy Analytics. "Android's weak profitability for its hardware partners will worry Google. If major smartphone manufacturers, like Samsung or Huawei, cannot make decent profits from the Android ecosystem, they may be tempted in the future to look at alternative platforms such as Microsoft, Tizen or Firefox."